Many of us who race in cheap-car amateur endurance series have wild fantasies of running like the pro teams we watch at places like Daytona or Le Mans. One set of six-time 24 Hours of Lemons winners racing today is living out that dream by racing in the Continental Tire Sports Car Challenge race, and I am infinitely jealous. Texas-based Winward Racing had an unlikely path to the pros—they started off racing in some of the events I could actually afford to do, and have worked their way up to debuting the new Mercedes-AMG GT4 in America, and running in the main support series to the Rolex 24. “Oh, I was there!” I exclaimed. Sure enough, they were talking about my current Porsche 944's debut race—in Lemons, a series that started off as a parody of the 24 Hours of Le Mans, complete with comical themes, jokey awards and the encouragement to bring something to a race track that really shouldn’t be there. Cars are supposed to be worth $500 or less, and fun takes the priority over outright speed. Winward’s story is a far but pleasant cry from the usual tales of drivers getting their start in karts at a single-digit age thanks to moneyed parents. Like me, they saw their first Lemons race at MSR-Houston, decided that it was adequately insane and had to do it. But the Winward guys did it right. They had a hilariously convincing Back to the Future-themed Nissan 300ZX that was ludicrously fast, and reliable, and for four years, they tried to follow the Lemons series as much as possible. It won them the first full 24-hour race they tried at Joliet, with a small crew who all drove the car—and drove it up from and back to Texas. “The key to winning races in Lemons is to build a reliable car,” said Russell Ward, who is Bryce’s son and another driver on the Winward team. “I think in general, we were eight to ten seconds off the quickest car, but we always kept the car on the track and kept plugging away,” said Bryce. Instead, they picked up time in by driving clean and doing simple things to make pit stops easier, like modifying the fuel filler system on their 300ZX. Eventually, they decided to move into entry-level pro racing. The team approached Kelly-Moss Motorsports about running a Porsche 911 GT3 Cup car, who introduced them to pro drivers Damien Faulkner and Jeroen Bleekemoelen, who coached for the team. They first raced the GT3 Cup at COTA in 2016, and also did a lot of drivers’ education events when they weren’t racing—thirty or so a year. And they were fast. The team credited their Lemons experience with teaching them how to manage traffic, be consistent and carry speed through corners on a race track. Lemons and the series like it offer a lot of track time for a team for not a lot of money, so you can just log lap after lap over six to eight hours of uninterrupted time even on the non-full-24-hour races. Eventually, Russell came to CJ Wilson Racing, where he and Faulkner put the car on the podium at Daytona in Russell’s sixth pro race in the Continental Tire Sports Car Challenge. Faulkner went to race with HTP Motorsport in Europe, which connected the Winward Racing crew with Mercedes-AMG. Mercedes wanted to bring their new GT4 car to America, so Winward was in the right place at the right time to do so. They first brought it to the 24 Hours Series race in Texas, and then raced it in Dubai. 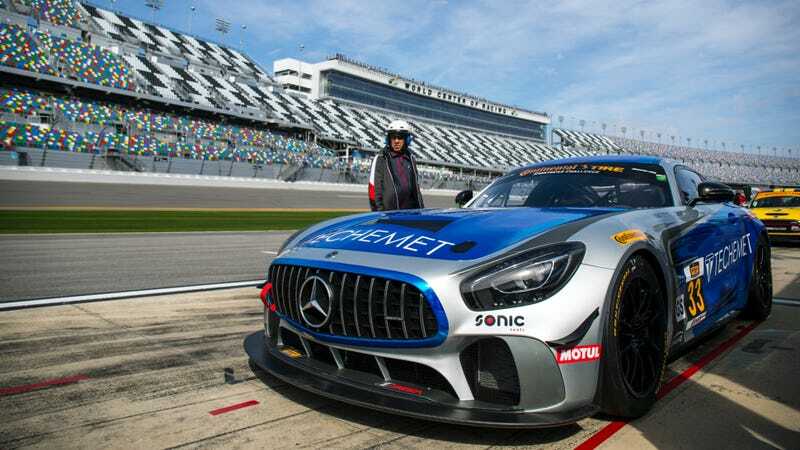 Winward Racing and HTP Motorsport have three of the Mercedes-AMG GT4s in the top GS class of the CTSCC race happening today at Daytona, which is a far cry from Lemons. Fortunately, these guys seem like they’ll race whatever they can get their hands on. They said they may go back to Lemons—only this time, they may let their crew drive the car. I mean, it’s only fair. I&apos;m At The 24 Hours Of Daytona Because Why On Earth Would I Be Anywhere Else This Week?